Built by Rowhedge, 32tons, 54gross. 56ft long, 17ft wide and 6 ft in depth. 300 passengers. She served on the passage from 1936 until 1978 before being sold to a River Clyde ferry concern who renamed her Kenilworth. (She is still there). Hotspur II was introduced to the service in 1936. 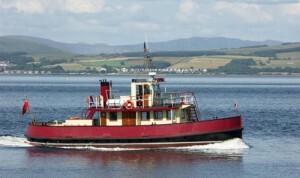 She was built by the Rowhedge Ironworks yard in Essex. Hotspur II proved very popular with the travelling public, and such was the demand for the new half hourly service that an order was placed for a new vessel – Hotspur III. Hotspur III was launched in 1938. She was almost identical to Hotspur II, being just a fraction larger.